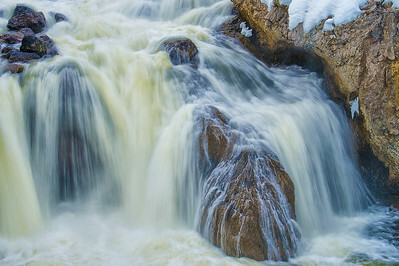 I had the opportunity to travel to Yellowstone NP Wyoming in 2014 February with members of the Foothills Camera Club. In winter the park is closed to private vehicles. The only way in and around the park was by way of snow coaches or snowmobile tours offered by the National Park. o It contains half of the world's geothermal features & 2/3 of the world's geysers (1300 with an average of 465 active in any year. 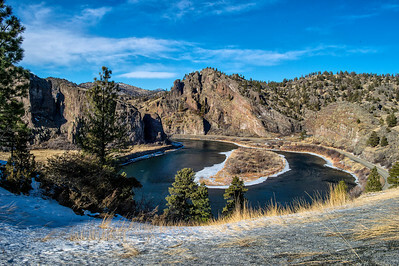 o Yellowstone Caldera formed by 3 supervolcanos includes much of the park. It lies over a hotspot where molten rock from the mantel rises to the surface. This is exhibited by the numerous geothermal vents e.g. Old Faithful. o Yellowstone Caldera averages between 1000 - 2000 measurable earthquakes per year. o Recent media reports stated that Yellowstone is over due for a supereruption..... but scientists suggest that this is not true (whew!). Day 2 we took a 4 hour ride by snow coach to Old Faithful. On the coach ride we toured past several geological sites and herds of bison slowly making our way to the lodge. Once registered, we had lunch and then hiked along the boardwalk and trails amidst geysers and other thermal features within hiking distance. 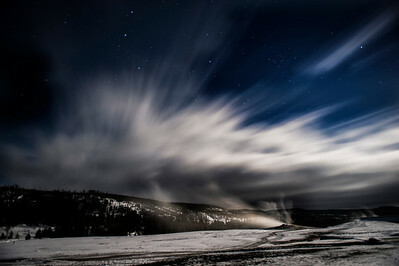 That night we took night shots of the Original Lodge, Education Centre and Old Faithful. The stars, moonlight and moving clouds were great for taking photographs. We climbed down off the snowbanks into individual log cabins for the next 2 nights. Day 3 We took an 8 hour snow coach tour looking for wildlife and seeing snowy landscapes. Day 4 we hiked again on the trails and boardwalks. The morning gave us lots of blowing snow followed by later day sunshine. Day 5 we travelled back to Mammoth Hot Springs. 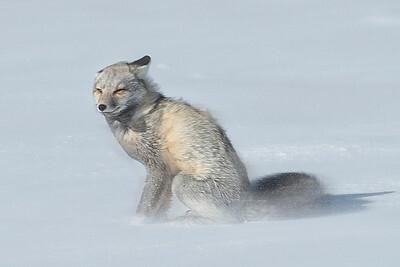 On the way we got a stellar opportunity of an unique coloured red fox hunting in the blowing snow and some winter landscapes. We stayed that night in Gardiner just outside the Park Boundary. Day 6 we travelled the Larmar Valley, a road open to the public known for the fine scenery and abundant wildlife. 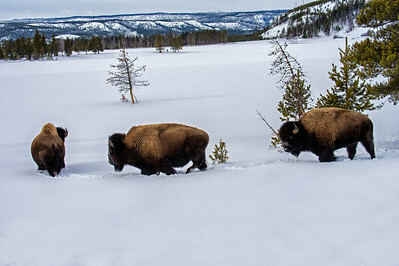 While we didn’t see the wolves, we did get a look at some very active bison close up and got some great landscape shots. Day 7 we headed back to Calgary shooting our way home. I arrived tired with many memory cards full of pictures and a memory that will last a lifetime. To make it easier to view, I have divided the slides into several sections. 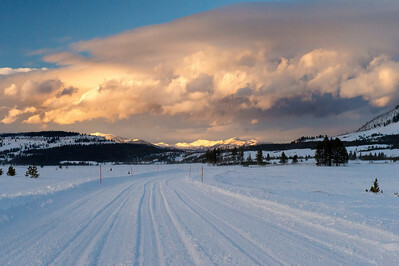 I hope you will enjoy this winter look of Yellowstone National Park. 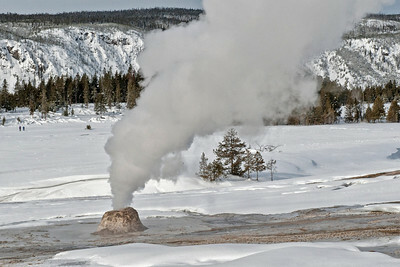 Old Faithful Lodge - Geysers etc. 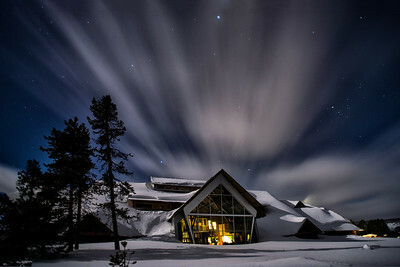 Old Faithful Lodge - Night Photos, Landscapes etc.